Last Friday we had our weekly team meeting. At that time it was my turn to present an icebreaker game. Every week after our meeting, we always had a game to lighten up everybody and be energized...ahahaha! I was having a tough time thinking on what kind of game I will organized but thanks to Google, I decided to chose the Photo Scavenger Hunt Game. After all, we love camera so might as well used it to the game and I'm sure my team mates will love this as well. I divided the team into 2 groups with 3 members each. They will need a camera for each group and a list of scenes/things to hunt for. The ONLY RULE is that everyone has to be in each picture. Rotate photographers so everyone can participate. I've given them a time limit of 10 minutes to accomplish everything. 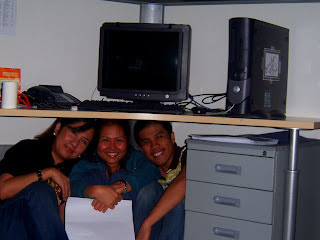 It was really fun since they are running around the office taking pictures here and there. "I can't believe we all fit in here!" 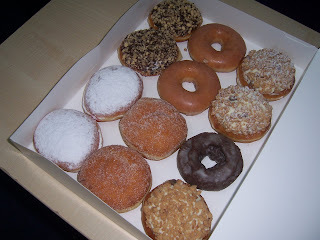 A dozen of Krispy Kreme doughnuts as our afternoon snack!